Weather: Cloudy and a bit warmer, light wind. Moon: Waning, less than a day before new. Moonset 3:38pm. Overhead 10:31am. Every so often I hear someone say "when is fishing season?" The answer to that question is simple, it's always fishing season. There is really no time of year that you can't fish, but as the seasons change, anglers must alter their approach. Most winters, we have at least some period of time where the lakes in Northern New Jersey are frozen. That period seems to be coming early this year. Although many rivers will remain free of ice, most boat owners will pack their boats away as the rivers are low and unsafe for boating and ramps are covered with ice. My boat is not designed for river fishing, so I fall into that category. So, when I headed out on my boat with Joe for some musky fishing on Thanksgiving weekend, I knew in my heart of hearts that it would be the last time I had my boat out in 2013. The day was exactly one year since I Lindsay bought her for me as an early Christmas present, and it could not have been a more fantastic season. This trip was a few weeks ago at this point, but since I knew I was about to go on a dryspell with fishing time, I figured I'd save report to put out at later date. As I sit here writing this, it is bitter cold outside. We've already had our third dose of snow, and temps aren't coming much above freezing over the next few days. Before I owned a boat, I would take my ice fishing gear out in October. It was my most favorite time of year. I guess now I'm a little sad that I won't be using my boat or musky fishing for a few months, but I shook that off this weekend and started to get a little excited for the hardwater. I put my boat trailer on cinder blocks this weekend to keep my tires off the ground all winter, I replaced the gas lines on my power auger, ordered new blades for my hand auger, dug out the tub of tip-ups and even put my sled in the back of my truck. Brian will be home this weekend, and a reunion is shaping up for this weekend. I'm hoping it will be on the ice, but we'll find a way to do some fishing one way or another. Although it doesn't always line up with the calendar, my first ice fishing trip marks the end of one fishing year and the beginning of another. For the last 3 or 4 or 6 years, I have kept saying that the next year could not possibly be any better, and once again it was. It was a fantastic year of fishing, and I could not have been happier about having a boat and the amazing fish I caught. My goal was to catch 6 muskies this year, which would have been one more than I caught in 2012. My "outside" goal was 10. This year I caught 12 and missed and saw many more. My biggest fish was a 47 inch true strain that was over 25 pounds, another trophy in my rather short career as a musky angler. I caught tiger muskies of 42 and 44 inches, both big fish, especially for hybrids. Those three fish were all caught in my boat. In total, half of my 12 fish were 39 inches or better. It wasn't all about the muskies though. I had the best ice fishing trip of my life this past winter, caught my biggest northern pike ever, my biggest smallmouth bass ever, a bunch of nice walleye, had a fantastic trip for hybrid stripers on Matt's birthday, had an epic battle with a 50-pound tarpon on medium action tackle while in Aruba with Linds and a lot of other wonderful outdoor adventures with Lindsay, my sister and my friends. This was truly a memorable year, and once again I am going to say how I don't see how next year can be much better. Merry Christmas to all and to all a BIG PIKE!!!!! Inspiring recap. I enjoy your blog. I got my biggest smallmouth this year, too. And some walleyes. Over the course of the year it was like you were catching a musky every week. And to think this is New Jersey. As a kid I dreamed of muskies--in Minnesota. 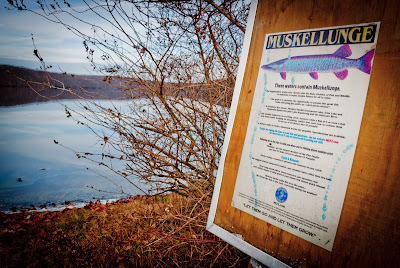 I never would have guessed there would be muskies in Mercer County. I was blown away when I hooked one in the Delaware when I was 18--who knows, I may catch one yet. Thank you very much Bruce. I enjoy reading your blog as well. Have a Merry Christmas.